Credit Suisse is one of the most prominent names in physical precious metals bars. The Swiss bank was the first bank to introduce a series of gold bars available in smaller sizes for retail investor clients. Both Credit Suisse and UBS remain the two most prominent banks in the precious metals industry. 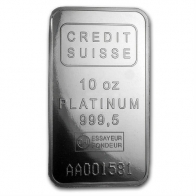 Credit Suisse platinum bars are recognised worldwide. These bars are primarily sold in 1 Ounce and 10 Ounce sizes, but are also available in smaller sizes. 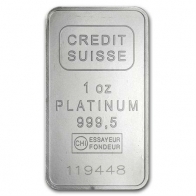 Credit Suisse platinum bars are available for VAT-exempt storage in Switzerland and for worldwide delivery.